Our much loved Cathy passed away suddenly on September 4, 2018. She was 61 years old and had lived her life protected by family and friends due to Down Syndrome. She was born in Tokyo, Japan, while her father was stationed there as a U.S. Army officer in the mid 1950s. She spent most of her life with her parents in Springfield, Virginia, graduating from West Springfield High School in 1979. For the last 25 years, she lived in Yorktown, Virginia. 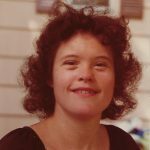 As a young woman, Cathy participated in the OP Shop and was proud of her numerous Special Olympics Awards for swimming. She greatly enjoyed bowling and dancing, specially in events with the ARC of Greater Williamsburg. Halloween was a special time for her, dressing and parading in costume, competing for prizes. She loved going out for meals, attending football games, and church; she really liked meeting new people, laughing and telling them they were “beautiful” and hugging them and not letting go. Little children and animals were drawn to her gentleness. She had a droll sense of humor, often making people laugh with her funny way of looking at the world. Cathy was preceded in death by her parents, Alfred L. and Eleanor M. Brassel. She lived the last 6 years of her life mostly with her brother, Alfred (Jr.), and her sister-in-law, Suzanne Brassel. She enjoyed numerous visits with her sister, Jeanne, and brother-in-law Steve Ford in North Carolina. She is also survived by her nephews, Tris, Eugene, and Gavin Ford, her niece, Valery Brinda, and their families. Her family is especially grateful for the wonderful care and love Cathy received from Connie Jacob and Sheila Andrews, for both of whom Cathy had deep affection. She was very happy living with Sheila and her family during the last 9 months of her life. Cathy will be buried in Arlington National Cemetery alongside her parents. A memorial for her and a celebration of her life will be held in November. Anyone who wishes to contribute to help disabled citizens in memory of Cathy is encouraged to consider The ARC of Greater Williamsburg. Arrangements by Amory Funeral Home, Grafton, VA.